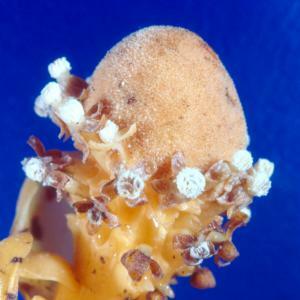 The female flowers on the top half of this flowering stalk of Balanophora fungosa are unbelievably small--they just look like a grains of a white powder. The male flowers have petal-like structures (brownish in color) surrounding the white pollen-bearing portions. Return to the Balanophora fungosa page or the Parasitic Plant Index.